This exceptionally versatile and efficient studio flash is able to deliver lighting fast recycling times and stable output throughout the entire output range. Equipped with accurate and reliable TTL mode, this unit can be successfully used when lighting conditions are changing rapidly. The built-in Navigator X receiver allows full wireless control and triggering up to 100m. High Speed Sync is also available (up to 1/8000s). The Atlas 600 Pro TTL stands out for it’s high color consistency throughout entire power output range. When high color accuracy is needed, the photographer can activate a specially designed Color Priority Mode. In this way, whatever power output is set, the flash can be triggered with the highest possible accuracy. White balance fluctuations in this mode will not exceed +/-75K. In standard mode white balance is rated as 5600 +/-200K. Flash is able to emit long bursts of precisely controlled light in both Color Mode and High-Speed Sync. 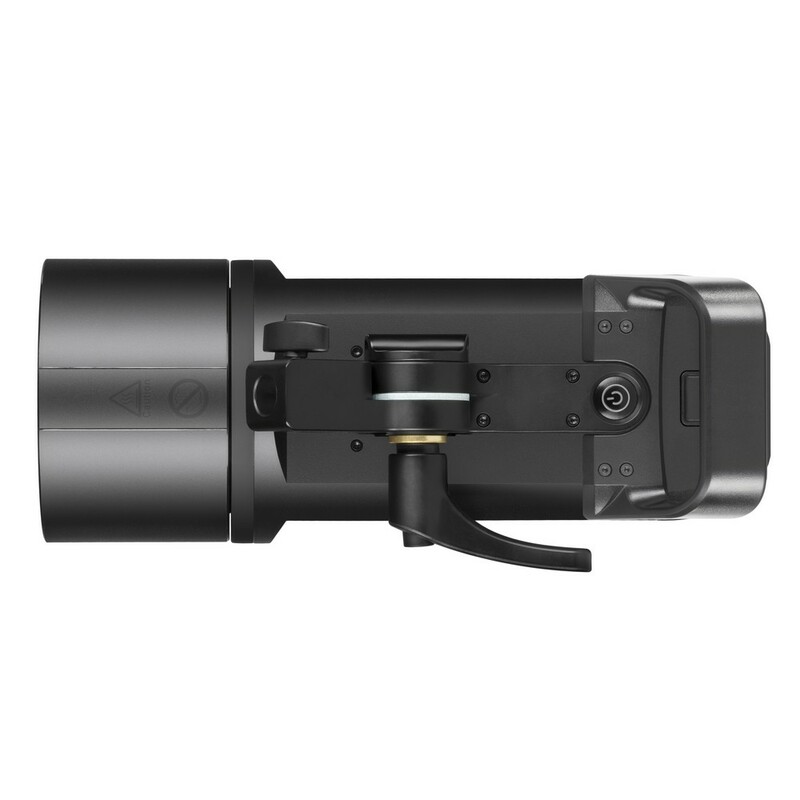 When set at the maximum power, the Atlas 600 Pro TTL is ready to be triggered again after just 1.3s! New flashtube design provides the best light quality and allows to use full potential of every light modifier. The tube is protected by a glass dome, equipped with a frosted front surface for even light distribution. Moreover the flasthube can be changed easily and no additional tools are required to do so. 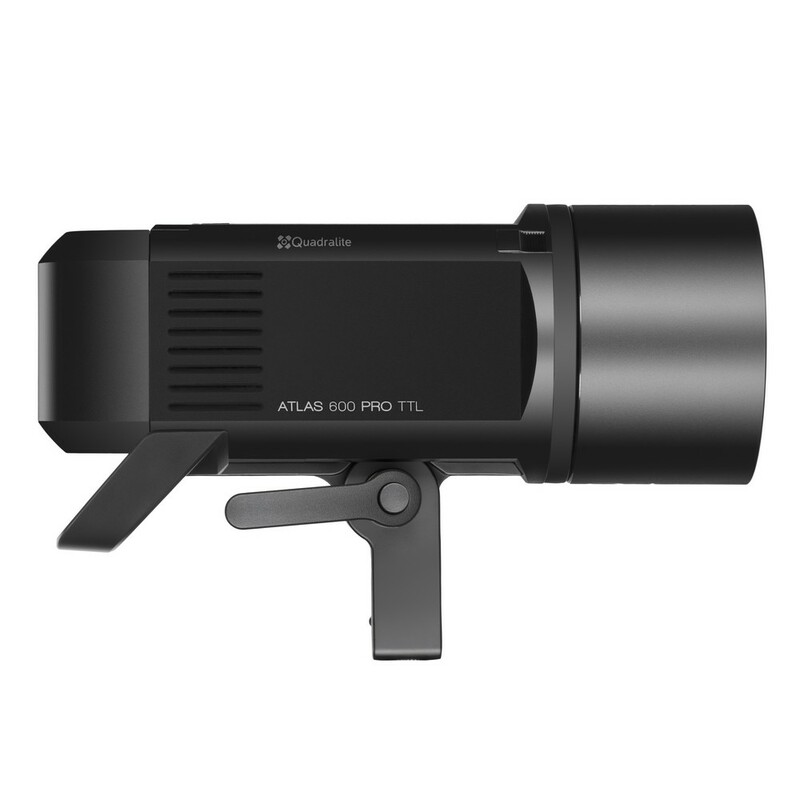 Atlas 600 Pro TTL is equipped with a highly efficient and powerful modeling light utilizing LED light source. This 38W chip is an equivalent of approx 500W halogen bulb without it’s drawbacks such as high operating temperature or warm colors. 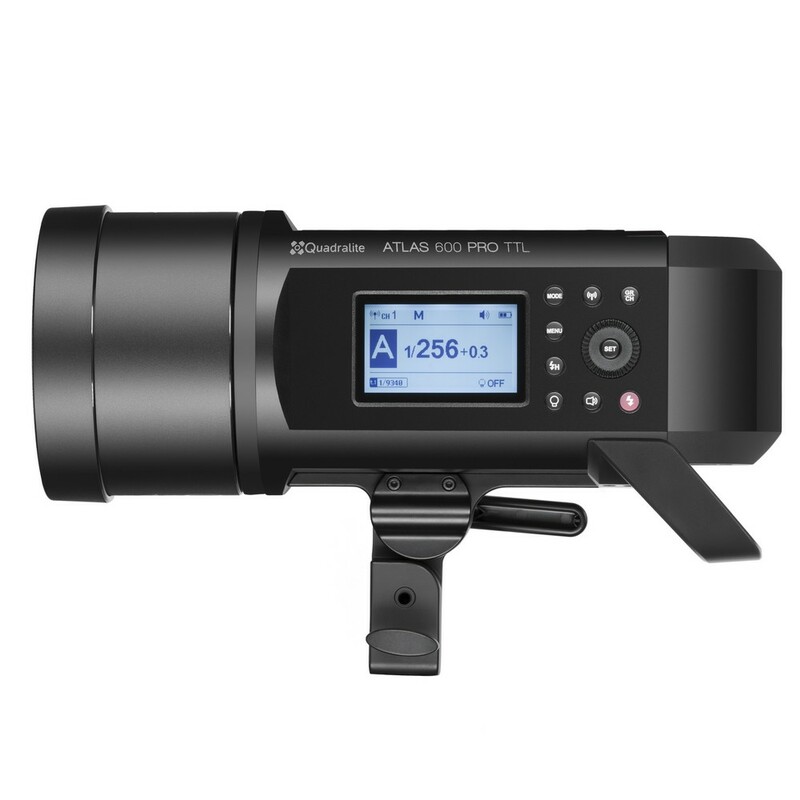 Atlas 600 Pro TTL is powered by high capacity Li-ion battery unit. This 2.6Ah powerpack is sufficient enough to deliver up to 350 full power flashes. One battery is supplied in the kit and can be easily changed when depleted. Unit can be fully charged in less than 3h thanks to specified charger (included in the kit). The Atlas 600 Pro TTL is equipped with newly designed 5” silver reflector which is compact and delivers wide and even light coverage. However the reflector can be replaced by one from the wide selection of light modifiers supplied by Quadralite or other manufacturers. You can modify the light according to your needs thanks to a wide assortment of sofboxes, reflectors, beauty-dishes, snoots, umbrellas etc. 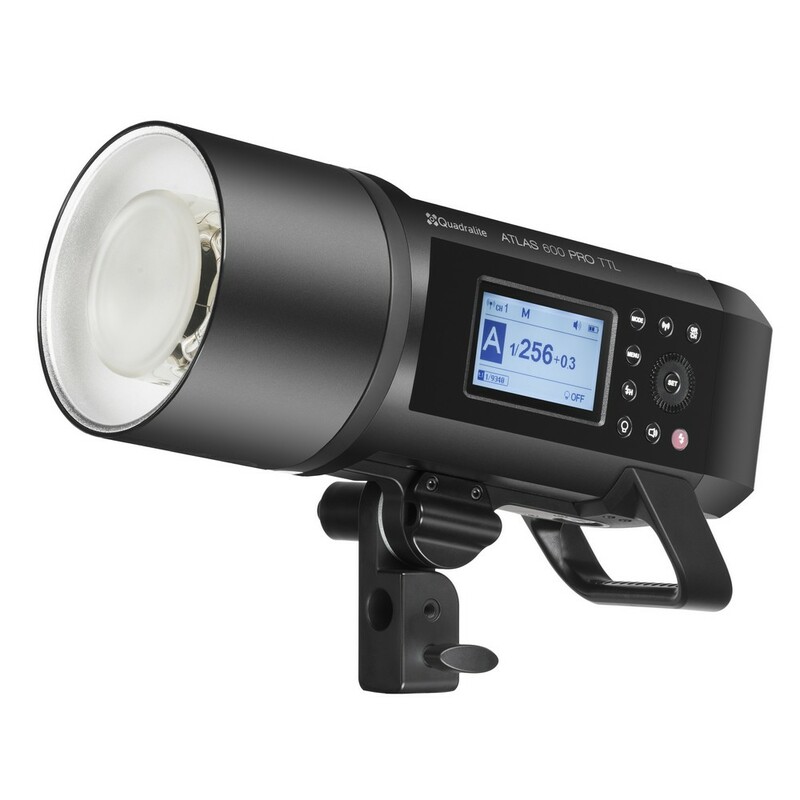 The flash can be also used with additional accessories such as Atlas Pro FH600 flash head and Atlas Pro AC Adapter (those products are not included). The flash housing is made of high quality plastic. A large back-lit LCD screen is easy to read even under strong ambient light. The light modifier bayonet and tripod mount are both made of metal to ensures durability. Tripod mount clamp allows smooth and precise tilt adjustments and is strong enough to withstand heavy loads. This flash can be use even with the Quadralite Parabolic Octa 150cm softbox. A set of newly designed accessories will be available within the next few months. For those who want to use the Atlas Pro in the studio just like the normal studio light, an AC Adapter will be released. It will allow you to power the Atlas Pro directly from the wall sockets without keeping the batteries fully charged all the time. Additional flash-head will also be released to make the flash easier to use especially on boom stands or when handheld by assistant somewhere on location. To keep the workflow with large light modifiers as smooth and as comfortable as possible, additional back panel handle will be introduced. All above mentioned accessories will be available in spring 2018. * if you want a flash with even shorter flash duration look for Quadralite Pulse Pro X. ** you are required to use a proper Quadralite Navigator X controller to ensure full compatibility with a given camera model. Detailed information has been provided in the flash manual.